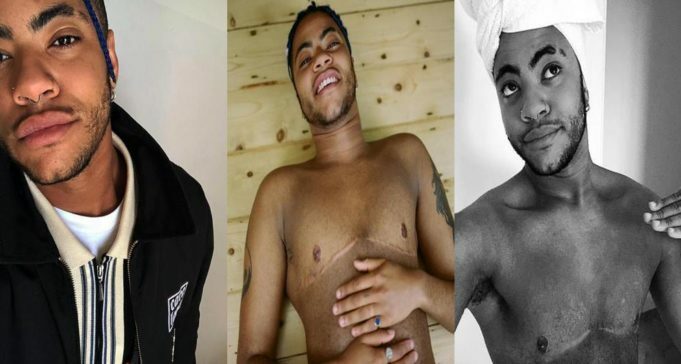 Legendary singer Sade Adu’s transgender son, Izaak Theo, 21, took to Instagram to show off his scars following his breast removal surgery last year. Writing on his Instagram few months back, the only known child of the Nigerian-British singer revealed that he underwent surgery recently, and is now able to wear the male designer shirts he had previously left hanging in his wardrobe. So many tops I can wear now that I couldn’t before my surgery so happs!! Plus copped this piece,” he said in the post, posing in a Raph Lauren shirt. This interesting update comes after he revealed that he already lost his previous feminine voice. Ila, who seemingly now goes by the name ‘Izaak Theo’, shared a video of his remarkable development since he started taking testosterone injections. And that’s not all: he already has grown facial hair, and now topped with the male physique, one can hardly guess he was ever a female.